Michael Lumb will miss Twenty20 finals day and England's two Twenty20s against Pakistan after being ruled out for the season due to a broken foot. Lumb was fielding in close against Somerset when he was struck by a shot from his England T20 opening partner Craig Kieswetter. Lumb had struggled for form since returning from the World Twenty20 in the Caribbean and was given a break by Hampshire to allow him to recharge his batteries. The time off appeared to have worked when he had found his touch in the longer format with 158 against Durham last week. 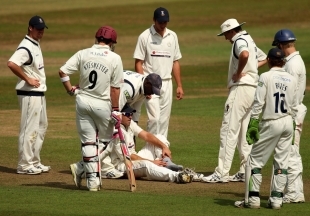 England will also miss Lumb in their two Twenty20 internationals in Cardiff early next month. He proved a valuable player in their triumphant ICC World Twenty20 campaign in the Caribbean in May, when he played all seven matches. However, following the two matches against Pakistan, England's next Twenty20 internationals are not until early January following the Ashes series so Lumb will face a long wait to see if his winner's medal from West Indies is the start or end of his England career.